Located on the estuary of the river Rance, in the region of the world with the greatest tides, the dam faces the sea and links Saint-Malo to Dinard. 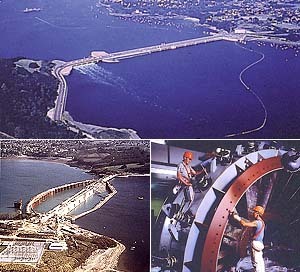 Built between 1961 and 1966, it uses the strength of the tides to produce electricity, which makes the Rance dam a unique tidal power station. La Rance Tidal Generation Plant is currently the world’s largest and oldest operational tidal power plant. The project involved building a dam 330 metres long in which the turbines were to be housed, a lock to allow the passage of small craft, a rockfill dam 165 metres long and a mobile weir with 6 gates to rapidly balance the levels for the emptying and filling of the reservoir. This large tidal range provides a large hydrostatic head, which aids the plant’s power production. The plant has 24 separate horizontal 10 MW turbines. La Rance plant utilizes double effect instead of single effect turbines. When all turbines are functioning, the turbines provide an overall output of 240 MW of power. This 240 MW is enough power to meet the electricity needs of about 300,000 homes.